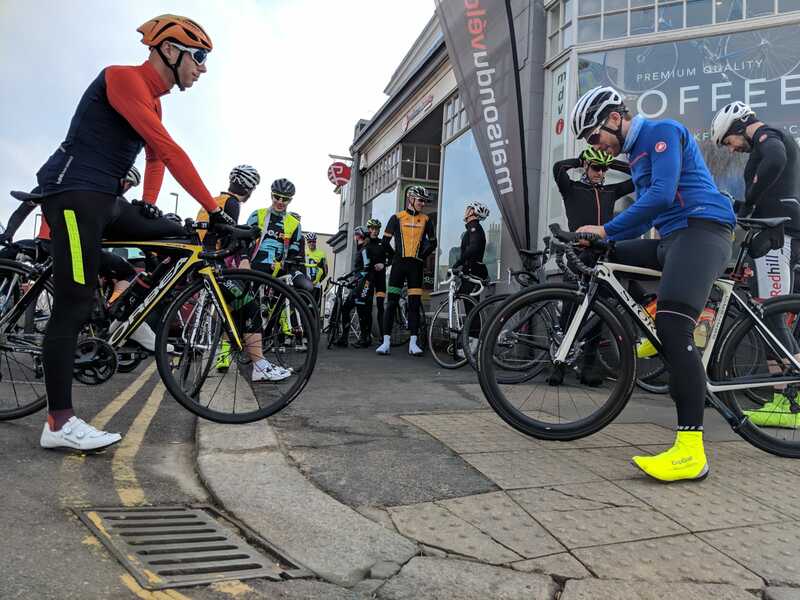 Norwood Paragon members helped to organise the first ever 1904RT training weekend - which offered an opportunity for Paragoni to get to know the new recruits and pass on racing knowledge. In total, 35 riders took part across three different sessions, which were open to Paragoni, 1904RT and Maison du Velo's club members. 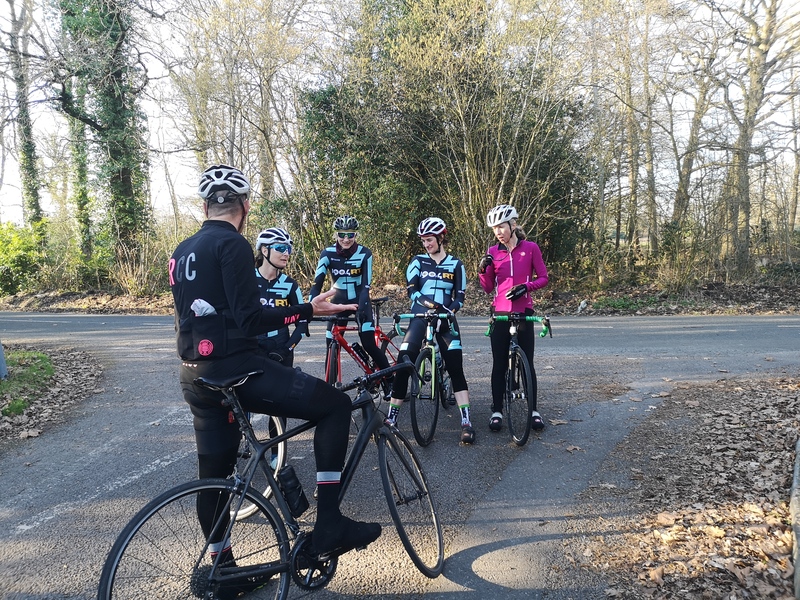 Sessions, devised by Marcus Bruton, included a tempo ride followed by skills session on Saturday and an endurance ride on Sunday. The skills sessions benefited from input from external coach Ian Watson, who offered critique on sprinting form using video footage, and ran a Q+A in the evening. 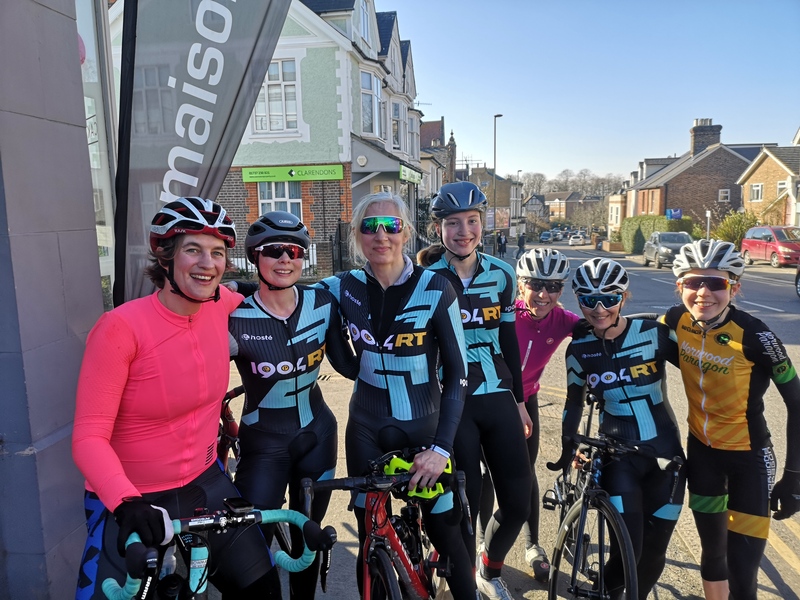 On Sunday, Austyn Tusler led the women's team ride, instructing riders to attack and chase at key moments whilst Marcus led the men in a through-and-off to ensure they won the hare and hound. Each session had three groups rolling out, one for the men's team, one for the women's, and a more moderately paced option led by Duncan Murdoch for those not looking for a leg-ripping experience. 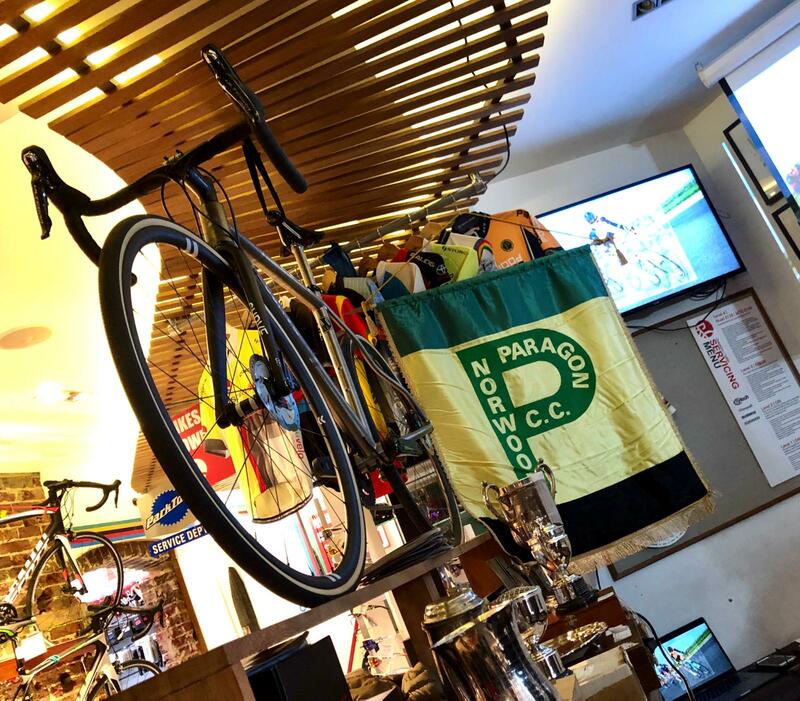 Maison du Velo bike shop provided an HQ for the weekend, putting on a pasta buffet at lunch time to keep riders fuelled before the team meal on Saturday evening - which was, as per the entire weekend, open to all Paragon members to enjoy. Trophies for the 2018 racing season were awarded following the club AGM on Friday February 1, at Maison du Velo bike shop in Reigate. 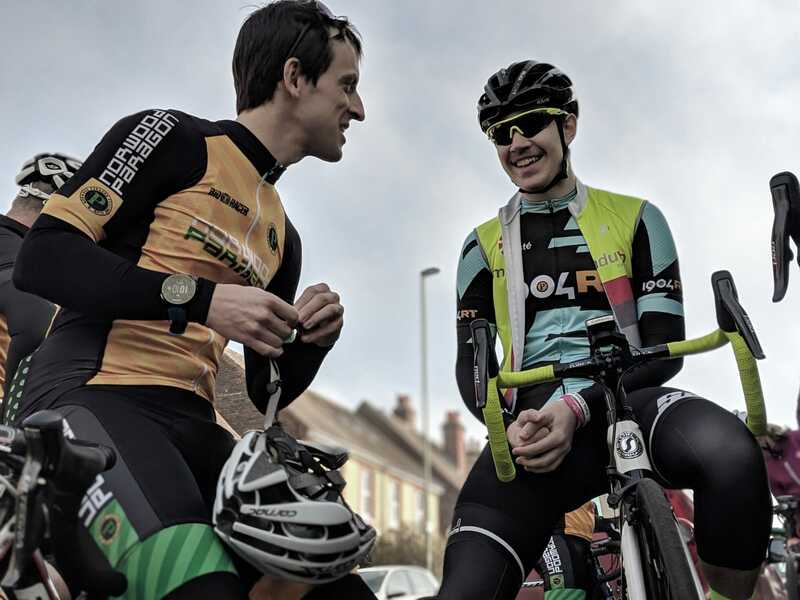 After a season where our promoted events seemed to be attacked from all angles - with cancellations due to lack of entries and roadworks taking their toll - it was excellent to see that the racing spirit was still far from deterred. The season held an array of stand-out performances, the highlights of which where (ok, will be) etched into silver for generations to come to remember. Men's road race champion Andy Critchlow amassed 109 British Cycling points, maintaining his first category license and competing at a host of National events. Critchlow picked up the award for the most Surrey League points, too. Women's road race champion Michelle Arthurs-Brennan accumulated 142 BC points in total, also picking up the highest ranked second cat award. Best third category rider (at the start of the season) went to Anna-Marie Hughes, who was also crowned regional Under 23 champion for the year. Junior road race champion was George Skinner, who moves away from the Paragon for 2019 but had an excellent run with us. 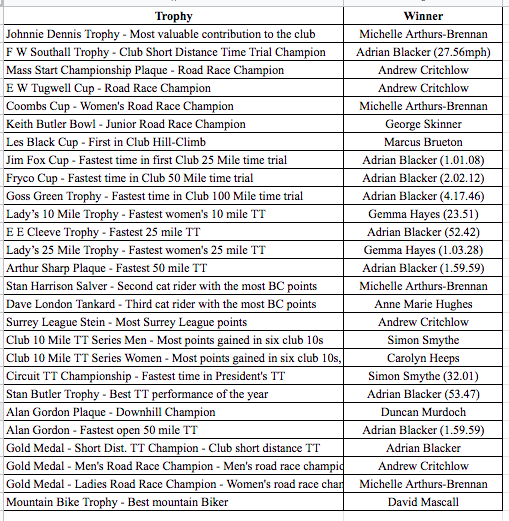 Prolific time triallist Adrian Blacker made an almost clean-sweep of the TT trophies, with the fastest 10, 25, 50 and 100 awards. He was beaten to the circuit champs trophy and club 10 award by outgoing secretary, Simon Smythe. On the women's side, Gemma Hayes took the lionshare of the limelight, as she draws closer to her goal of going under the hour for a 25. At the club events, Carolyn Heeps came out top of the table. Best at going uphill was Marcus Brueton, whilst Duncan Murdoch was quickest down the other side for a fourth year running. The best mountain biker could go to none other than muddy bike secretary, Dave Mascall. The Johnnie Dennis Trophy for the most valuable contribution to the club went to yours truly - Michelle Arthurs-Brennan, with the creation of race team 1904RT cited as the primary justification. Receiving the trophy is an absolute honour, and I hope to do it proud over the next twelve months. The AGM ran smoothly. Minutes should be available via email. In short, Jon Masters was re-elected as Chairman, and Steve Watkins as President with Vice Presidents remaining the same. Phillipa Watkins joined the committee as social secretary, and Simon Smythe stepped down as time trial secretary, leaving the position vacant (and due to be filled!). Simon Smythe will remain on the committee. There is need for a webmaster, I will look into a new website for the club myself, with a view to create something a little like the new 1904RT site. It was highlighted that the Les Ingman road race will take place on Sunday April 14 and that marshals will be needed. Please put the date in your diary and contact Jon Masters if you're able to help.